Content: Choose your smart device for the car. 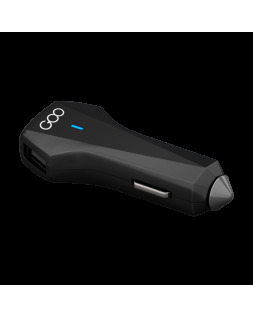 Charge your smartphone easily with the Goo Smart Car Charger. It plugs into any standard car cigarette lighter and contains many features. Compatible with all iOS and Android mobiles, this smart car accessory has two reversible USB ports. No internet connection is required, and it charges your phone really quickly. Its compact size means you can take it everywhere with you. To use your GPS in your car or to listen to music safely, opt for Goo's universal phone support. This high-tech accessory is made of silicone to ensure your smartphone is held firmly in position. Thanks to its clip, it can be attached to your car's air vent. Goo offers you a whole range of high-tech devices for peace of mind during your holiday trips. The smart car charger that locates your vehicle using its application! The GOO team is on hand to meet your needs and ensure that you are fully informed. all catalogue products are guaranteed one year by GOO. Colissimo, TNT or Mondial Relay - chose your preferred option. Your online payment is totally secure with Monetico. Monday to Friday 9pm to 6pm by email contact@gooconect.com or via our online 'contact' form.